Hundreds of brilliant blooms, high above a landscape—this is the sort of beauty that transforms a place. This pack grows fast and starts flowering at a young age. The mature trees have a gracefully arching shape. 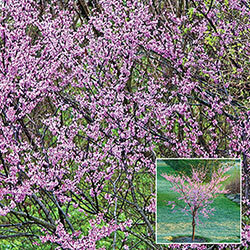 Redbuds are excellent in multiples, establishing consistency in the most visually striking way. However, If you buy multiples for landscaping at a garden center, you'll have a pretty hefty bill. 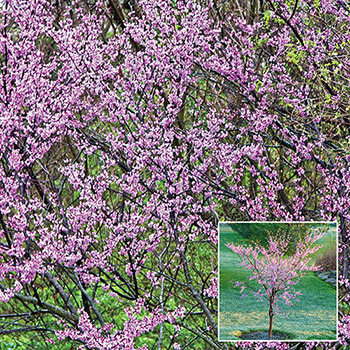 Our Redbud Flowering Tree Starter Pack gives you younger, smaller trees. They establish roots faster than bigger ones and you can get them at exceptional bundle prices. We used faster growing cultivars and only easy-to-grow native varieties. 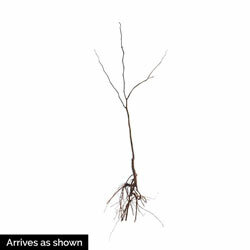 Planting Instructions: Plant with the root collar slightly below the ground surface. The root collar is where trunk of the tree becomes the root. Prefers a sun to partial sun location and will tolerate heat and humidity. Water well after planting. Soil Requirements: Rich, well-drained, moisture-retentive soil is ideal, but will tolerate a wide range of soils. Never allow it to dry out, but it will also not tolerate poor drainage. Pruning: Prune to desired shaped, if needed. Remove any dead, broken, or crossing branches to maintain a healthy specimen. Prune in winter when the tree is still dormant. Winter Care: Add organic mulch to conserve soil moisture. Stake young plants to prevent wind damage.